Article discussing the little-known 1920-21 uprising in the Gilan province of northern Iran, and its importance for the workers' movement in both Iran itself and the wider middle-east. Schapour Ravasani, Sowjetrepublik Gilan: Die Sozialistische Bewegung im Iran seit Ende des 19 Jh. bis 1922, Basis-Verlag, Berlin (Postfach 645, 1 Berlin 15), 1973; 638 pp., DM19 .80. The period immediately following the Russian revolution occupies a special, still emotive, place in the European workers' movement. In the confused conditions following the collapse of the Central Powers, and under the inspiration of events in Petrograd and Moscow, several attempts were made to extend the frontiers of workers' power - in Berlin, Munich and Budapest in 1919, and in the Turin soviets of 1919-20. All were in the end defeated by the resurgent forces of counter-revolution; and the cost of these defeats was, as we now know, so enormous - not only for the individual movements themselves, but also for the evolution of the post-revolutionary regime in Russia. Yet, if the Spartakists and the Budapest militia retain a special place in the memory of the European movement, the same cannot be said of an important and in some ways comparable episode in the history of Middle Eastern communism, namely the insurgent republic that was established in the Gilan province of northern Iran in June 1920 and lasted for sixteen months until its destruction by the central government in October of the following year. The history of Middle Eastern communism is too often seen as having begun as an atomised, underground process, far removed from the mainstreams of revolutionary politics in Europe or East Asia. This is in part accurate, and for much of the region the main channel of influence was initially the immigration to Palestine of Jewish militants formed in eastern Europe. But this isolation of the Middle Eastern communist movement was a later development, a product of the earlier defeat of movements that arose in the aftermath of the first world war very much as did those in Europe - amidst the collapse of the old empires and in close connection with the Russian revolution. These movements, in Turkey and Iran, were to some extent comparable in the conditions of their formation to the militant vanguards of communism in Europe; and the Iranian movement in particular mobilised a substantial force of Iranian proletarians in these years. Short-lived and regional as it was, the Gilan Republic is therefore of more than symbolic or antiquarian interest; like its European counterparts it presaged many political questions that were important for the whole later history of the communist movement in the colonial world. Among the questions posed in the Gilan experience were: the place of the agrarian question in the revolutionary struggle, the forms of class alliance appropriate in colonial and semi-colonial countries, the links between anti-imperialist and socially revolutionary struggles, the problem of converting a regional revolt into a nation-wide movement, the relationship to the Islamic religion and to the Muslim clergy. The Gilan experience also raises in a very direct way a problem that goes far beyond the colonial world, namely the relationship between the revolutionary struggle in one country and the policies of an already established revolutionary state. For there is no doubt that the movement in Gilan relied heavily on Russian support, yet that after some time this support was withdrawn and that the Russians reached an accommodation with the central government. This policy shift occurred not in the era of Stalinist degeneration nor in that of Mao's Three Worlds Theory, but at a time when Lenin and Trotsky were at the heights of their influence in the Russian party. Whilst this does not necessarily mean that the Russian policy was justified, it raises a very interesting example of the links between revolutionary movements and states and is a test case against which to judge any general conception of what an internationalist foreign policy might be. Despite its brevity, the Gilan Republic is also important for the history of the revolutionary movement in Iran itself. Whilst it provided the context for the establishment of the Communist Party of Persia in June 1920, it was also the first and so far only time in which Middle Eastern communists were active in a radical rural guerrilla movement of a kind more commonly associated with Latin America or the Far East. Both the communists and their radical nationalist allies were products of the left wing of the constitutional movement that arose after 1906. In this sense the Gilan Republic represented the final, socially revolutionary, potential of that upheaval, and its defeat in late 1921 not only marked the end of the movement's course, but, as in the analogous cases in Europe, it ushered in a new counter-revolutionary regime. 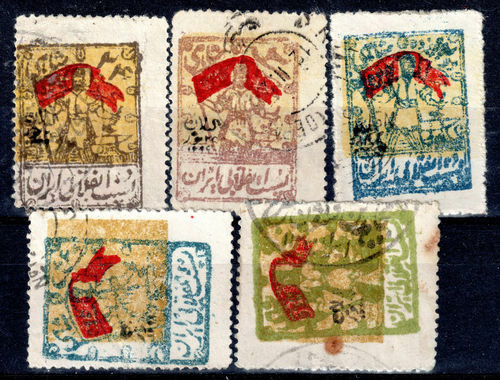 For 1921 marked the advent to power of Reze Khan, the military dictator who was encouraged by the British to seize power precisely in order to crush the revolutionary movement in north Iran. Fifty-eight years later, as we live through the aftermath of the Pahlavi dynasty's overthrow, it is important to remember the proletarian and revolutionary traditions of the Iranian people which the Pahlavi dynasty was created to suppress. Through the suppression of these earlier movements, the Pahlavis not only established their own position but also created a political vacuum in which other, far less progressive opposition currents have been able to grow. Indeed it is an especially important corrective to remember the Gilan Republic at a time when the Ayatollah Khomeini and his associates would have us believe that they represent the sole tradition of valid political opposition in Iran. The Gilan Republic represented the combination of two different radical trends in Iranian politics. The first were the revolutionary socialists who had originally been formed amongst the many thousands of Iranian migrant workers in the Russian Caucasus and who, together with Georgians and local Azerbaijanis, founded the Hemmat (Determination) Party in 1904. During the constitutional revolution itself, social-democratic groupings also sprung up in a number of northern Iranian towns, and the one in Tabriz corresponded with Kautsky and Plekhanov as well as maintaining active organisational contacts with the Hemmat and other parts of the revolutionary underground in Russia.2 In 1916 a newall-embracing party, the Adalat (Justice) Party, was established amongst the workers in Russia but with underground organisation in parts of Iran itself, and by 1917 it had an estimated 6,000 members in all. During the first world war, Kuchik Khan and his followers, numbering around 5,000 men, were able to establish themselves in the wooded, mountainous terrain of Gilan; and when, after 1917, British interventionist and White Russian forces were using northern Persia as a base for attacking the Bolsheviks, the campaign of Kuchik Khan became interwoven with the civil war in Russia, just as the Polish struggle after 1918 was linked to events across the Russian frontier. The fusion of the two trends came in May 1920, when Bolshevik naval forces operating in the Caspian captured the Gilani port of Enzeli and - after linking up with Kuchik Khan's forces and bringing in about 2,000 Adalat party members - declared the establishment of a republic in Gilan on June 5. Thus, although the Bolsheviks stated that they would not play an active role in Persia, they were prepared to support the revolutionary movement there, in view of the shared aim of ousting the British from the country. In June 1920 the Adalat party held its congress in Enzeli and changed its name to the Persian Communist Party. Forty-eight delegates represented around 2,000 members, and after considerable dispute a basic programme was announced: land reform, anti-imperialism and support for the Bolshevik revolution. This was seen as a prelude to the 'sovietisation of Iran'. Although the new PCP and Kuchik Khan formed a coalition government, there was no real agreement; problems soon arose, and Kuchik Khan decamped to the mountains in protest at what he considered to be a too radical land reform programme. The PCP also tried to break out of their Gilani base and to extend the revolutionary movement to the rest of the country, but when they tried to march on Tehran in August 1920 their forces were defeated. As a result of these setbacks, the Russian party brought pressure to bear on the PCP and the Central committee, headed by Sultan Zade, was replaced by a new central committee in October 1920. This change was executed by one section of the Russian party, under the direction of Stalin who had responsibility for Caucasian affairs, and was neither formally overseen by the rest of the leadership in Moscow nor officially accepted by the Comintern. The new leadership, headed by Haidar Khan Amugli, suspended the radical land reform programme and made overtures to Kuchik Khan, but the latter was only reintegrated into the Gilani government in May 1921 and by this time the revolutionaries were faced by a much more capable central army headed by Reza Khan in Tehran. This new military regime fought off a second Gilani attempt to march upon Tehran in August 1921 and tried to divide the Gilani forces by making separate overtures in Kuchik Khan. But although these attempts to negotiate with Kuchik seem to have failed, he did break again with the PCP and in September he killed the Party leader Haidar Khan. In October, admist these divisions in the revolutionary camp, Reza Khan's forces reoccupied Gilan and the PCP leadership fled to Russia. Kuehik Khan, unable in the end to reach any accommodation with the central government, remained a fugitive in the mountains where he froze to death that winter. A central element in the changing fortunes of the Gilan Republic was the shifting focus of Russian policy, both in regard to relations with Britain and in regard to relations with the Tehran government. In 1919 and early 1920 the Russians had adopted a militantly hostile attitude towards the Persian government, which they saw as being an instrument of British imperialism. They evidently hoped that it would be overthrown and replaced by one more sympathetic to them - either nationalist anti-imperialist, or socially revolutionary under the leadership of the PCP. However the main aim was always to remove the British influence from Iran and when this became more possible through negotiation with London and Tehran than through a military offensive they concentrated their efforts on this. By the spring of 1921 they had negotiated agreements with both countries, guaranteeing non-interference in Russia's affairs in return for, among other things, their respecting the neutrality of Persia. The treaty with Britain, which concentrated on trade, included a clause in which the Bolsheviks undertook not to engage in anti-British propaganda in Asia; and under the agreement with Reza Khan's government the Russian troops began to withdraw from Gilan. In so doing, the Russians removed an important support of the Gilan Republic. Whilst they tried to produce some reconciliation of the Gilani movement and the central government, this was a failure; and amid protests from the Baku section of their own party the Russians then accepted the destruction of the revolutionary enclave as a necessary part of their wider campaign to neutralise their southern neighbour. Evaluation of this episode is extremely controversial - as between Iranian nationalists and communists, within the Iranian left, and within Soviet historiography - and the first major study of the Gilan Republic to appear in a western language has a definite emplacement within these controversies. Much of Schapour Ravasani's book is taken up with the history and economic conditions prior to the Gilan period itself, but in the sections on Gilan he lays the blame for the defeat of this movement on two main factors. The first was the policy pursued by the PCP in the July-October 1920 period: this he sees as having been ultra-left and as having involved the mechanical application of Russian political schemas to the very different conditions of Iran. The result was a failure to work with the 'national-revolutionary' current represented by Kuchik Khan (pp267-272). The second reason Ravasani advances for the defeat is that the Russians subordinated their role in Gilan to their overall policy dictates; whilst at first they encouraged the Gilani movement, they later sacrificed it in favour of better relations with Britain (pp354-5). Ravasani's work is a massive compilation on the situation in Persia during this period and contains nearly 300 pages of documents on the contemporary revolutionary movement. Its arguments are, moreover, phrased in Marxist terms, and he frequently berates the PCP leader Sultan Zade for ignoring Lenin's advice about co-operation with 'national-revolutionary' leaders. Yet despite the weight of narrative argument and documentation there are several aspects of his critique which render it unconvincing, and behind the formally materialist and revolutionary framework of the analysis one can detect significant elements that are rather idealist and, in a negative sense, nationalist. The first problem with Ravasani's analysis is one shared by most of the other literature on the subject, namely that it treats of the Gilan movement in uniquely political and international terms, and does not provide any analysis of the specific socio-economic conditions prevailing in Gilan itself. This is an essential prerequisite both for understanding the nature of Kuchik Khan's movement and for judging how far the favourable revolutionary conditions in Gilan were common to the rest of the country. Ravasani tells us (p285) that both Kuchik Khan and the PCP believed that 'the objective conditions for a revolution in Persia were present but this cannot be asserted as a mere voluntaristic statement. And the information available from some contemporary sources indicates that, in fact, Gilan was a rather special and anomalous province of the country. One of the major problems of rural movements is that they tend to be localised - not just in consciousness, but in the condition that generate them; and the problem of generalising such struggles into becoming national movements is a difficult one. We have recently seen a striking case of this in Oman where the revolutionary movement, strongly based in the southern Dhofar province, was unable to break through into the more strategically vital northern part of that country. The Huk guerrillas in the Philippines after 1945 faced a similar, and ultimately fatal, restriction, and there have been many other cases in Africa and Latin America. From what we know, the conditions in Gilan exemplify some of the classic conditions for peasant-based guerrilla war. They explain the genesis of Kuchik's movement, but by the same token such conditions were localised. This aspect of the Gilan movement is not dealt with in Ravasani's study; and whilst it would be unfounded to assert that this movement could not have broken out of its regional context, it is idealist, an abstract assertion, to assume that it could have done so. To prove the assumption made by Kuchik and the PCP would involve some general picture of the socio-political forces at play in Iran at that time, whereas what they, and Ravasani, have provided remains rather schematic. A second major difficulty with Ravasani's account is his description of the divisions within the PCP and his critique of the 'ultra-left' line. This critique also has a strong nationalistic undertone, since he holds that the Sultan lade group made an erroneous analysis as a result of the influence - intellectual and organisational - of the Bolsheviks. Ravasani endorses the policies of Haidar Khan; yet, as he has shown, Haidar was as much the organisational product of Russian influence in the party, and it is not so clear that Haidar's overall evaluation was more cautious than Sultan lade's. At the Baku Congress of the Peoples of the East in September 1920, Haidar Khan called on the Bolsheviks to arm the Persians against the imperialists, and declared: 'The Soviet regime of northern Iran is planning for a march on Tehran'.6 And there is one striking point (p326) where Ravasani endorses Haidar Khan's emphasis on creating a 'unitary republic' - in contrast to what he sees as the Russian-influenced call for a republic recognising the existence of different national groups. If ever there was an instance where the supposedly misleading Russian influence was in fact right, and the instinctive Persian nationalist position wrong, this was it; for the failure of the Iranian left to confront the depth of the nationalities issue has plagued it ever since. The explosion of the nationalities time-bomb in the wake of the Shah's departure is an eloquent testimony of the real similarities that link Iran to Russia in this respect. Ravasani's account of the conflict between the PCP and Kuchik Khan remains rather imprecise. We know the different sides accused each other of, and we know how susequent Soviet historiography has erected a case against Sultan lade. But we do not have a detailed account of what did actually occur - for example, of what was the land redistribution policy, how much land was actually distributed, what were the supposedly 'anti-religious' policies of the PCP, etc.7 Similarly, despite his defence of Kuchik Khan, the latter remains a rather shadowy figure in Ravasani's account. He is obviously a sympathetic character, and the PCP may well have unnecessarily provoked him. But we do know that the main reason for his alliance with the Bolsheviks was his hostility to the British and it is not clear if he had any elaborated analysis that could have been counterposed to that of the PCP. Ravasani's account of the overall outcome of the Bolshevik influence on Iran is, at best, one-sided for it ignores certain positive results of this relationship. First of all, there would probably have been no PCP at all but for the previous three decades of migration of Persian workers to Russia and their involvement there in the communist underground. Nor would the Gilan Republic even have been established but for the fortuitous extension of the Russian civil war into northern Iran as a result of the British counter-attacks against the Bolsheviks at that time. Thirdly, by his own account and accepting for the moment his contraposition of the Sultan Zade and Haidar Khan leaderships, it was the Russians who were able to introduce a more cautious note into the PCP's policies. Beyond this considerations, however, there remains the fact that in Ravasani's account the placing of blame upon the Russians is not merely exaggerated but serves as an analytical substitute for the primary question, namely the strength of the revolutionary movement in Iran itself. It is here that the absence of any specific analysis of the conditions in Gilan and the extent to which the were typical becomes such a major vitiating factor. The influence of faulty Comintern ideas and the absence of Russian troops did not prevent the Chinese party from recovering from the debacle of 1927 and from building base areas in this period. If the PCP could not do this then the reason must be found in the internal conditions of Iran as well as in external failure on the part of the Russians. Consideration of the Russian role involves another general question, namely whether the Russians 'betrayed' the PCP by withdrawing their troops and signing the February 1921 agreement with the Tehran government. For the assumption underlying Ravasani's critique is that it was incumbent on the Russians to support the Gilani movement unconditionally. If this is so, then the decision to withdraw from Gilan in 1921 is on a par with many of the later 'betrayals' by Russia and China of revolutionary movements – from Stalin's role in Spain, Greece and Poland, to China's role in Sudan, Chile and Iran itself. It raises in an acute form - and, as noted above, in the period prior to any possible 'degenerations' - the question of the relationship between revolutionary states and revolutionary movements. To take an extreme example: it would have been possible in September 1973 for Cuba to have airlifted paratroops to Chile to help sustain the Popular Unity government in the face of the fascist coup. Or to take another example: it would have been possible for the Soviet, or Chinese, navies and airforces to have intervened directly in the Vietnam war. Neither of these things happened, and no-one can soberly claim that they should have happened because, and this is the point, of the balance of international forces at that time, the consequences for Cuba, Russia and China if they had done this, and the balance of forces inside the country concerned. This brings us back to the Gilani movement itself; for, had that movement been stronger, then it would have been able to take advantage of the impetus given in May 1920 to spread through Iran. And if a genuinely revolutionary situation had existed in Iran, with a realistic possibility of a PCP-led movement coming to power, then the calculations of the Russians could have been rather different. Had they in that situation abandoned the movement they would have borne a much heavier responsibility. The accusation of a Russian 'betrayal' over Gilan appears to be a principled, internationalist, one; yet on closer examination it conceals a nationalist presumption, namely that the fault for the failure of the Gilani experiment lies with external, in this case Russian, influence. In so doing it omits to make an evaluation of the necessarily primary, internal, basis for assuming that a revolution was possible, and it omits to make a proper internationalist evaluation of the situation which would have taken not just the interests of the Persian movement but of the whole international communist movement into account. The defeat of the Gilan Republic forms part of the overall defeat in that period of the revolutionary initiatives outside Russia - in Germany Hungary, Italy, in Turkey and Iran. It cannot simply be blamed on some Bolshevik 'betrayal'. It reflected the almost overwhelming disequilibrium it the international balance of class forces at that time, as well as the limitations of the movement in Gilan itself, which was both regionally) confined and internally divided. The British were able to promote the coup in February 1921, out of which grew a force capable of overwhelming the Gilanis militarily; and when this new government indicated that it would end British military influence in the country, the Bolsheviks signed a non-interference treaty with it. The counter-revolutionary regime established at that time lasted until 1979; and whilst Iran today is a very different country in socio-economic terms from what it was in 1921, many of the political issues raised in Gilan are re-emerging. The relations between socialist and nationalist forces, between secular and religious oppositions, between regional and national forces, and, not least, between Iran and its northern neighbour - all these issues will be posed acutely once again in the months and years ahead. The defeat of the PCP in 1921, and the subsequent destruction of the much larger Tudeh Party in 1953, have left the field open to the religious opposition, which now occupies a more important place in Iranian politics than at any time since the 1890s. But the paralysis, confusions and the anti-democratic nature of the Islamic movement demonstrate as eloquently as could be that only a socialist programme can solve the enormous problems that Iran now faces. After so many years of suppression, and despite its many divisions, the Middle East's oldest socialist movement finds itself once again at a point where it may be able to win over the mass of the Iranian workers and peasants; and, with a revolutionary situation on the borders of the Soviet Union for the first time in three decades, the consequences for it too may be considerable. In August 1979, after completing the above review, I was able to visit Iran and to make a brief trip to Gilan. Various small indications showed that the history of the Gilan period is still an actual one for Iranians and that the disputes of that time are, in different ways, appropriated for today's use. In Tehran the former Stalin Street, leading up to the Russian War Memorial, has been renamed Mirza Kuchik Khan Street, and in the main square of the Gilani administrative capital Lahijan, the plinth formerly celebrating the tenets of the Shah's 'white revolution' was adorned with portraits of Kuchik Khan. The port of Enzeli, known for the past fifty years as Banar (= Port) Pahlavi, has now regained its old name. In the streets of Rasht vendors were selling copies of a radical left paper called Jangal, in memory of the earlier movement. Yet it is not just the left which remembers this period. One of the basic tenets of the Muslim radicals is the Islam and communism are mutually inimical: they point to a host of instances where they say 'communists' have persecuted Muslims - Soviet Central Asia, Afghanistan, Eritrea and, of course, Palestine. . . . Iranian history too is seen through this optic and Kuchik Khan is presented as a heroic Islamic radical who was betrayed by the Russian-controlled communists. 1. Further background material on the Gilan period can be found in the first chapter of: Sepehr Zabih, The Communist Movement in Iran, Berkeley & Los Angeles, 1966. This is the standard work on the subject. On the contemporary movement in Turkey see George Harris, The Origins of Communism in Turkey, Stanford, 1967. The Gilan episode is also discussed in the major works on Soviet foreign policy in this period, including: E. H. Carr, The Bolshevik Revolution 1917-1923, vol. 3, London 1953; Louis Fischer, The Soviets in World Affairs, London 1930; X. Eudin and R. North, Soviet Russia and the East: 1920-1927, Stanford, 1957. Many of the theoretical issues raised by the Gilan experience and the place of the Asian revolution in Soviet strategy at that time are discussed in H. Carrere d'Encausse and Stuart Schram, Marxism and Asia, London, 1969. 2. Cosroe Chaqueri, La Social-Democratie en Iran, Editions Mazdak (Casella Postale 517, 50100 Florence, Italy) ,1979 , gives extensive documentation of this early movement, including the letters from the Tabriz revolutionaries to Kautsky and Plekhanov, and the programmatic documents of the Hemmat party. 3. An early version of the Jangali Programme is given by M. Marthcenko, 'Kutchuk-Khan' Revue du Monde Musulman, vol. 4041, September-December 1920. Ravasani pp585-7 gives a later, 1920 version in English. 4. Background information on the economic and social conditions in Gilan is given by H. Rabino in Revue du Monde Musulman, vo1. 32, 1916-17. 5. Editions Mazdak have recently reissued a selection of Sultan Zade's writings, Politische Schriften, Florence, 1975, with an introduction and biographical note by Cosroe Chaqueri. Mter retreating to Russia in 1921, Sultan Zade spent several years in obscurity as an official in the state banking system, but re-emerged in 1928 at the sixth congress of the Comintern when, drawing upon his experience in this field of employment, he challanged the official theses on the dominance of finance capital in the capitalist world as presented to the congress by Bukharin. He was at the same time challenging the Soviet characterisation of Reza Khan as a progressive force. In the early 1930s he disappeared from political life, to be killed in the purges in 1938. Whatever else, this record of independence does not confirm the picture of Sultan Zade as the pliant tool of the Russian party. 6. Quoted in N. Fatemi, A Diplomatic History of Persia, New York, 1952,ch. 12. 7. The standard left position at this time was to distinguish between a minority fraction of the mollahs who were regarded as reactionary and linked to the land-owners, and a majority who were close to the poorer classes; see Ravasani, pp74-76. 8. In such contexts it is important to distinguish between withdrawal or withholding of support by a revolutionary state on the one hand, and an active support given to reaction in material or political terms which endorses repression against a communist movement on the other. The latter, of which there have been many cases in recent decades (the Hitler-Stalin pact, the Chinese endorsement of counter-revolutionary acts in the third world) can never be justified; but the Russian policy vis-a-vis Gilan was not guilty of it. 9. The most detailed study of the background to the Soviet-British rivalry in Iran is given in the three-volume work by Richard Ullman, Anglo-Soviet Relations 1917-1921. Vol 3, The Anglo-Soviet Accord, London 1972, p317-394, discusses British perceptions of the Soviet role in Iran and the Russian policy of attempting to neutralise the Tehran government. For a general survey of changing official Soviet accounts of the Gilan period see Central Asian Review, vol. 4, 1956. A vivid example of the censored Russian presentation of this period and of its consequences is found in the recently published volume of the USSR Academy of Sciences, Lenin and National Liberation in the East, Progress Publishers; Moscow, 1978, ch 10: 'Leninist Foreign Policy and the Peoples of Iran in their Fight for Independence and Social Progress'. This omits any mention of the divisions within the Gilan movement or of the fate of the Gilanis after the Soviet-Persian accord, and pretends (p316) that all Soviet forces were immediately withdrawn after the May 1920 landing. It also goes out of its way to commend Lenin's policy of disciplining those in the Baku section of the Russian party who opposed the withdrawal from Gilan and who tried to continue an active solidarity with the Gilanis (p321). Fittingly enough, the article ends with a complacent account of the state of relations between the Shah and the Soviet government, one that, among other distortions, omits any mention of the military supplies which Russia sold to the Iranian government in 1967 and 1975.